The Dass Dynasty ruled at Alstahaug through nearly a century. It is through three generations. Petter Dass became priest at Alstahaug and worked in the period 1689-1707. His son Anders Dass took over after his father’s death in 1707, and remained in that post until his death in 1736. Morten Sommer, married Anders Dass daughter Abel Margrethe Dass (1710-1791) and worked there as a priest after the death of his father in law. He remained in the post until his death in 1765. Alstahaug was a parish long before The Dass dynasty. The houses we visit at Alstahaug today are built on a meter thick cultural layer that possess traces of the yard as far back as the 1100´s. If we move a little outside the courtyard we find traces back to the Stone Age. A large burial mound is located outside the Haugsneset. It is called Kongshaugen and is the largest of several burial mounds in the area. The church is built in stone and most likely from the second half of the 1100´s, or about the year 1200, at a time when the conflicts between paganism and Christianity was strong. The church site has experienced the transition from Catholic to Protestant church. The archaeological sources from Alstahaug stems mainly from the yard of the rectory. The Cultural Heritage excavations under the church floor, in connection with a break restoration of Alstahaug church was led by architect Håkon Christie in the late 1960´s. The skeletal material is published by Per Holck (1969, 1974). Birgitta Berglund conducted some research in 1985. In this context there was conducted marine archaeological survey in Alstahaug. These smaller studies are published in Berglund 1995. The biggest excavation in the yard was completed in 1992 under the auspices of NTNU, The Museum of science in conjunction with the privacy of the parsonage. Birgitta Berglund led the project. She is currently a professor at the Section of Archaeology and Cultural History at the University of Trondheim. There was conducted excavations in 2000, under the auspices of the Museum of science. This time it was the Petter Dass monument that was to become floodlighted in connection with the millennium. The findings made ​​in this regard were mainly from the Reformation time, 1700-1800’s, some dated 1600. These have the same character as finds from excavations in 1992. The architect Håkon Christie led the Cultural Heritage´s excavations under the church and in connection with the restoration of Alstadhaug church in the period 1967-1969. These reports are found in the topographical archives of the Cultural Heritage and the Museum of science. In the autumn 1967, the choir and the eastern part of the ship got excavated. The Dass Dynasty´s tomb in the chancel was opened. There were found some coins. The western part was excavated in 1969. This section is under the eastern part of the new ship which was built in 1863-1865. The medieval Church’s foundations were unearthed during the excavations. Within the walls were a number of graves. 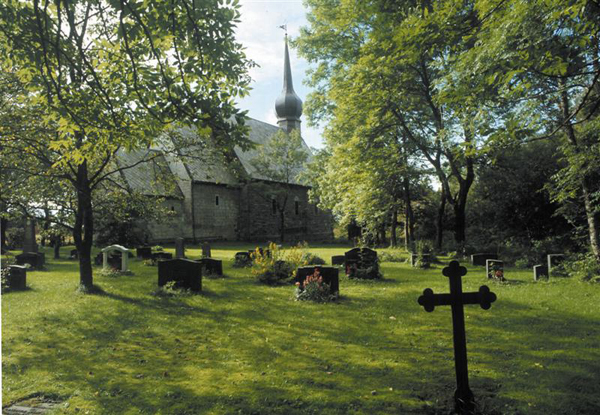 The entire ground area under Alstahaug church has been used as a burial so that the cultural layers are mostly destroyed. In the Dass family tomb there were found eight preserved coffins under the chorus. At the bottom there were traces of older burials (Holck 1969 p.18f). The skeletons were taken up, examined and photographed at site. They were not sent to survey to the anatomical institute in Oslo. Petter Dass burial was not found. The coins were found in the family tomb. Among other findings in the aisle, most graves were found in the old ship. A total of 56 graves in the church, and 111 skulls. A preparation of the findings were implemented in the winter of 2003. The Excavations in 1992 were more extensive than previous excavations at Alstahaug. A trench had to be dug to place a water pipe. The excavations were mainly concentrated in the southeastern part of the farm, starting in front of the southern entrance of the rectory. Four fields were dug up by 1 meter intervals in trench. At the top of all the fields were hard packed earth and gravel under the turf. Under this layer there were found settlement layers, which mainly consisted of layers of waste and wooden board floors inside the houses. These findings can be divided into two main phases. The upper layers of the houses from 1600-1700’s. The other is from the Middle Ages. The oldest finds were dated 1200. Most of the findings constituted stones and animal bones, but also metal, glass, ceramic, soapstone, chalk, flint, slate, brick/mortar, pumice and bare bones. SOURCES: Berglund, Birgitta, Alstahaug in Helgeland 1000-1750 Dass Dynasty and clergy stages itself, the Royal Norwegian Society of Sciences, Fonts 2007, no. 1, Tapir Academic Press, Trondheim, 2005.